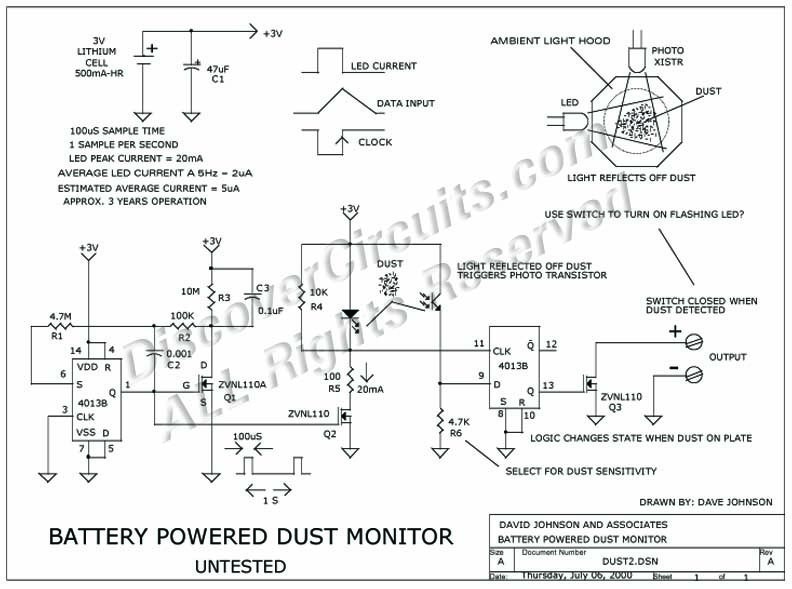 Circuit: TIME TO DUST INDICATOR__ Circuit designed by David A. Johnson, P.E. I thought about this circuit when I heard that a lot cleaning personal in hotels were either dusting rooms more often than necessary or not enough. I have not yet built and tested this circuit completely but in concept it should work. The circuit draws very low current from a +3v battery and could be housed in a package similar to a small ashtray. The assembly might be placed in a suitable out of the way area to collect dust. It would alert a maid when it was time to dust the room. The circuit detects dust with an infrared LED that is pulsed so its light shines onto a smooth flat plate. Any dust settling onto the surface is detected by a phototransistor, mounted at a 90 degree angle from the LED. When the dust reaches a particular level, sufficient light is reflected into the phototransistor to change the logic state of the circuit to an alarm condition. The alarm output could be connected to a beeper, a flashing LED or to one of the LED flashing circuits in this hobby circuit section.